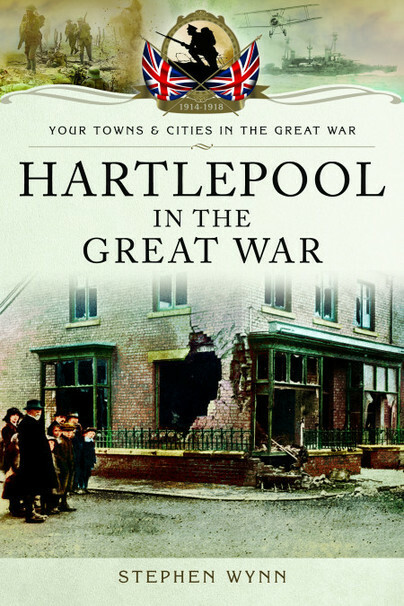 You'll be £12.99 closer to your next £10.00 credit when you purchase Hartlepool in the Great War. What's this? With the outbreak of the First World War, it was not surprising that a number of individuals who were of German decent, and who lived in Hartlepool and its surrounding areas, were rounded up and detained by the British military authorities, in the interests of both national security and for their own personal safety. They were held at the towns Stranton Ice Rink. Their numbers included the ex-German Consul for the Hartlepool's district as well as others who had been local residents of many years standing. The first soldier with connections to Hartlepool to be killed on foreign soil during the war, was Corporal 57561 John Robert Richardson, who was serving with the 54th Battery, Royal Field Artillery, when he was killed in action on 4 October 1914. He is buried at the Bergen Communal Cemetery at Mons. The war came to Hartlepool on the morning of Wednesday, 16 December 1914 in the shape of three vessels of the Imperial German Navy. By the time their attack was over, more than 1,100 artillery shells had landed on the town, killing 9 soldiers, 86 civilians and wounding a further 438. Amongst the dead was 29 year old Private 18/295 Theophilus Jones of the 18th Battalion, Durham Light Infantry, making him the first British serviceman to be killed on British soil as a result of enemy action during the course of the First World War. Before the war was over, his brother Alfred, would also be killed, during fighting at the Battle of Arras, on 3 May 1917. By the time the war had ended, some 1700 men and women from Hartlepool and its surrounding areas had paid the ultimate price of having served their King and country.